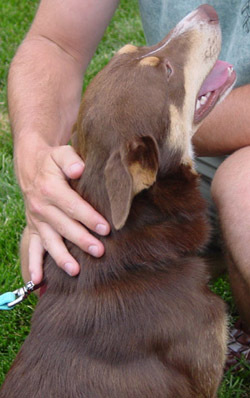 We have successfully placed over 2500 dogs since we launched the program in March 27, 1999. The dogs on this page are some our more recent placements. page. If you've adopted a dog from us, please keep us up to date on his/her progress so we can add and update him/her on our Success Stories page. 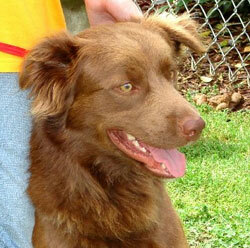 Alfie is a neutered male Aussie/retriever cross. Cute, friendly, plays great with other dogs. Active and Kim Bradley (dog trainer) said he might be good for a household that is into agility work with their dogs. They said he is two, but he has bright white teeth and is active like a puppy so we're putting him at around 15 months. Was turned in at a kill shelter and was to be pts the day he was rescued. That would have been such a shame.....he is a real sweet dog and will make some lucky family a great companion. Applicants, please be aware that Australian Shepherds are a sensitive breed and not to be put on electric fences. 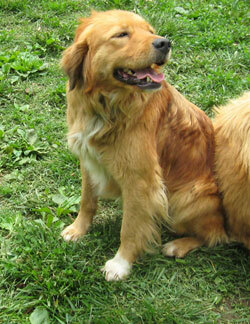 Alfie has the Aussie look, but Retriever personality in that he likes to retrieve and loves water. He will also jump up, so is not for young ones. Amos is a 13-14 week old male beagle/shep/lab mix puppy whose mom, Cora, looks like a Shepherd/Beagle. He is a big pup, but very laid back and not a high energy pup. He could have a litle Sharpei in him as he has that look. He's a really good puppy, a bit shy in his crate, but happy and playful outside. He will be at our "meet and greet" this Sat, 6/14 at Best Friends in Sudbury from 11-1 PM and we prefer you fill out an application ahead of time. Zoey is a sweet 3 month old Great Pyrenees mix. She came in with her sister, Tilly. They have had their first parvo shot, been wormed and had bordetella. They are cute and playful. Mom is Pyrenees, dad is Komondor. 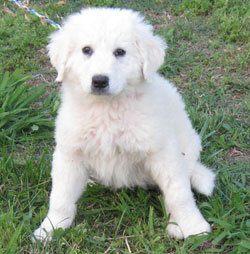 She is not that large, not like a Great Pyr by any means, but looks more like a small white golden retriever. 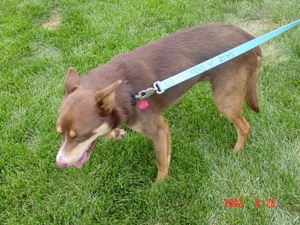 She is in a foster home in Wayland and can be seen immediately once we receive your application. We require a fence for families with children 10 and under and we do not want our puppies left alone all day with just a break in the middle. The rule of thumb for puppies is not more than one hour alone total for every month of the pup's age, so 3 months is not more than 3 hours alone. Brandy is 46# and is around 3 yrs old. She is quiet, a little shy, but loves to be petted. She is tiny and it is tough to believe she could be Molly's mother! Both were owner surrendered at a kill shelter. Vet records look like the previous owner did okay taking care of them. Not sure why he would surrender them to a shelter. They are good dogs. They are fine on a leash, good in the car, friendly with people and with my dogs. I don't know of any problems with either of them. Chip is a 13-14 week old male lab mix puppy whose mom, Cora, looks like a Shepherd/Beagle. He is like the middle child of the three fluff balls as his size is medium. Hershey is the smallest and Oscar is the largest. So Chip is in the middle. He is also the blondest. 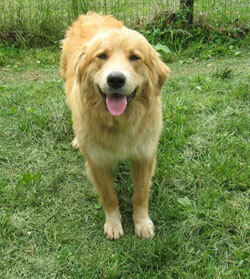 He has a mild temperament, as do all his littermates and loves to play. He will be at our "meet and greet" this Sat, 6/14 at Best Friends in Sudbury from 11-1 PM and we prefer you fill out an application ahead of time. Cosby is adopted, but we have more puppies coming in mid-July. 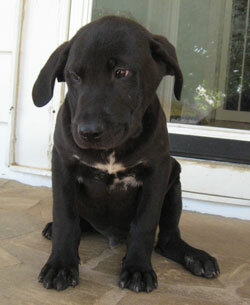 Cosby is a 13-14 week old male lab mix puppy whose mom, Cora, looks like a Shepherd/Beagle. He seemed to have picked up all the lab traits. He loves the water, he retrieves, and he likes to carry around big sticks. When you look at his littermates, you'll say, Where'd this one come from? He is very laid back for a puppy and is happy to drag a toy or bully stick in his crate and chew away. He's a really good puppy, will probably be large. He is very submissive. He is in a foster home in Wayland and you can see him M-F once we receive your application and determine that you meet the requirements for a puppy. Update from his foster mom: Cosby is settling in well! Gonzo and him had a wrestling match this morning that made me almost pee my my pants. Gonzo is very vocal when he plays and Cosby was trying to copy him, but was squeaking instead! too funny. But he has doing well on house training, the only time me pees in the house is when you put his leash on to go out when he first gets out of his crate, submissive peeing. But he is very sweet and playful. He found the toy basket in about 2.2 seconds of his arrival and he needs to take all the toys out and strategically place them so no matter where he is in the living room he has a toy at his disposal. 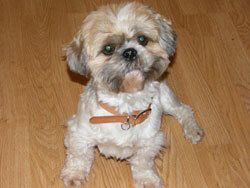 Elliott is an adorable Shih Tzu who is very sweet and friendly. He is good with other dogs, prefers small dogs. Before his rescue he sat in a shelter for a month with a broken leg. So when he came to us, we had him all checked at our vet and at Vescone and everyone agreed that the leg has healed without surgery. He's a happy and personable guy, but he was returned for biting the adopter's college-aged son when he leaned over him while he was just waking up from a nap. He is great with women but has growled at snapped at men so we suspect he was probably abused by a man or just never socialized with men and due to his small size is frightened of them. The ideal home would be an adult home, an experienced small dog person who can read dog body language and who will work with a trainer to rehabilitate his attitude towards men. He seems to like cats, is fascinated by them and could watch them all day, but his foster mom says he is seperated by a gate and is not sure if he would chase. He rides well in the car, loves to go places with you and his tail tends to wag non stop.We are looking for someone who is a stay at home or work from home. He came to us with horrible matting in his very fluffy coat, and had to be almost shaved down (as shown in the picture). Shih tzus require grooming every 6-8 weeks and brushing often to keep their coat from matting, which pulls on the skin and is painful for them. This breed can live to be 17-18 yrs old, so we want his adopter to make sure they want to make the commitment to keep Elliott throughout his long life when they make the commitment to adopt. 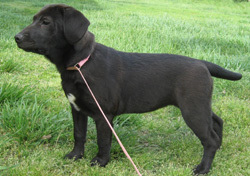 Hershey is a 13-14week old female shep/lab mix puppy whose mom, Cora, looks like a Shepherd/Beagle. She is the smallest of the three fluff balls and certainly the darling of the three. Hershey is a little timid inside but outside she just loves to play. She will be at our "meet and greet" this Sat, 6/14 at Best Friends in Sudbury from 11-1 PM and we prefer you fill out an application ahead of time. 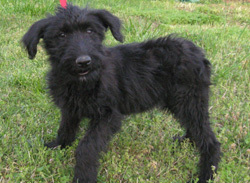 Kaley, one of Hannah's puppies, is a four month old Flat coated retreiver who is available NOW with no competition. We currently have no applications on her because she needs some physical therapy on a ligament tear in her shoulder. We will pay for the Physical Therapy. She will heal and be a perfect puppy just like all the other puppies who have lots of applications. She can go home right away if you are in commuting distance of Natick/Wayland where she is having her therapy. We expect her to have a completely normal life and she was given a clean bill of health by two veterinarians. You can meet her today once we have your application! She is 99% housetrained and a really sweet puppy. Kimara is a super sweet little dog. He was all of the below mentioned but has regressed due to the stress of moving him from his foster home in TN to the quarantine facility in MA. He is housebroken, leash trained, crate trained (all his foster dad has to do is say "Kimara, go to your room" and he goes in his crate! ) He gets along great with other dogs, cats and strangers. He is playful, very good natured....never aggressive with other dogs or people. Kimara is nervous with the transition of coming to MA so can be easily frightened and jumpy in new situations. We're looking for a quiet home where he can flourish. He is around 2 years old and weighs 20-25#. He is chihuahua/dachshund mix. Lobo is a 6-7 year old Aussie mix who we adopted out as a one year old. His family did agility and obedience training with him and truly loved him. He was recently returned through no fault of his own, as his owner is recently divorced and works long hours. Lobo was staying home alone all day and night by himself and his owner felt it unfair to him. He's in good shape, is a great companion, still loves to play and chase. He was raised with cats, but liked to chase them, but never harmed them. He is great with dogs, and with people. He was raised with a teenager so it wouldn't be fair to put him with young children. He is submissive and a real pleaser. 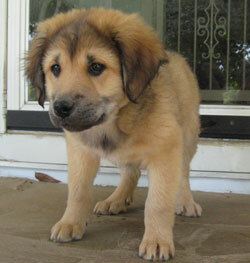 Maggie is an adorable mixed breed puppy whose mother was found as a pregnant stray. She was taken in and fostered and then her puppies as well. Her mom looks beagle/shepherd, but she seems to be mixed with something small. We don't expect she will grow to be more than 40 lbs. Possibly terrier. She's small. Once we receive your application, you can meet her. She got adopted by a family with small children and they quickly realized that it's difficult to take care of a puppy when taking care of small children. She was great with the kids and has a great temperament, but she is needy like a small puppy and craves attention. Molly is a giant-sized Golden Retriever mix. She came in with Brandy. Shelter said Molly was Brandy's mother, but I think from the vet records, it is the other way around. Molly is 77# and looks to be golden/pyr mix. She is calm, friendly and playful. She is a very sweet natured dog. She was 1 yr old in Feb. We've already received a TON of applications on her so don't get too attached, although we will show her on Sat and hopefully half the people who appled for her won't come. Ollie is a 9-10 month old pup. He is big and has some more growing to do. He is a SWEET boy he loves attention! He will roll over for belly rubs, give lots of kisses and sit nicely for pets. He "shakes" and knows sit/ down. He comes RUNNING when you call his name outside. He walks very well on leash and loves to walk. He loves toys and loves to play with other dogs. He is very crate trained, and sometimes will go in on his own for a nap. He is quiet in the house has no accidents and loves to chew on a good bone. He is very shy in new situations but comes out of his shell very quickly. He gets along fine with other dogs, although does best with dogs that are medium-big dogs, rather then really small dogs (he isnt aggressive). Because he is sometimes shy we think he'd do better with older kids (teens), but he would do fine with visiting children once he settles in. He came from TN, the same place we got his mom (Annabell, adopted a while ago). He is neutered and up to date on shots, he has seen our vet and got a clear bill of health! We aren't quite sure what he is, he looks like he has leonberger, or some large breed in him and his mom was a big flat coated retriever. He has a lot of love to give and loves to get loving back despite his past, can you be the special person to give him that love? 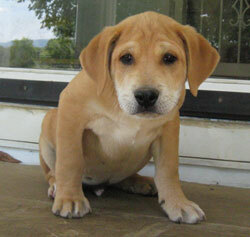 Oscar is a 13-14 week old male lab mix puppy whose mom, Cora, looks like a Shepherd/Beagle. He is like the big brother of the three fluff balls as his size is large, but he is also the gentlest. Hershey is the smallest and Oscar is the largest. 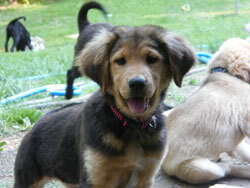 He has a mild temperament, as do all his littermates and loves to play. He will be at our "meet and greet" this Sat, 6/14 at Best Friends in Sudbury from 11-1 PM and we prefer you fill out an application ahead of time. 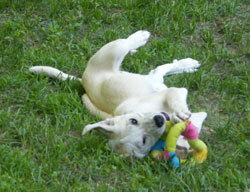 Peach is a 13-14 week old extremely sweet puppy who came up from TN with her siblings. Of the litter, she is the sweetest and most affectionate pup. She doesn't photograph well because she has one eye with a very light pigment. She is a favorite among the volunteers and we're hoping she gets a forever adopter who will dote on her. She will be at our "meet and greet" this Sat, 6/14 at Best Friends in Sudbury from 11-1 PM and we prefer you fill out an application ahead of time. 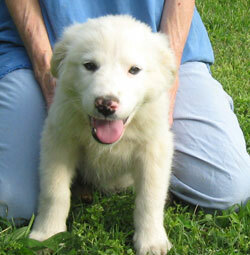 Plum is a playful 11 week old Great Pyrenees mix. She came in with her brother Ziggy. They have had their first parvo shot, been wormed and had bordetella. They are cute and playful. They are available after 6/13/08. We require a fence for families with children 10 and under and we do not want our puppies left alone all day with just a break in the middle. The rule of thumb for puppies is not more than one hour alone total for every month of the pup's age, so 3 months is not more than 3 hours alone. We cannot hold dogs/pups for you while you are on vacation and these pups need ready and willing adopters as we have other dogs waiting to come in. The situation in TN is urgent right now and the humane society we work with is overflowing, so please be sensitive to this issue when selecting a rescued dog. 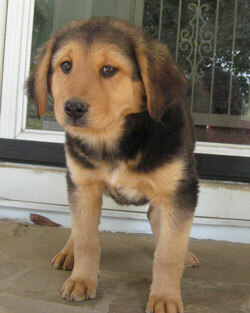 Sable is a 13-14 week old female shep/lab mix puppy whose mom, Cora, looks like a Shepherd/Beagle. 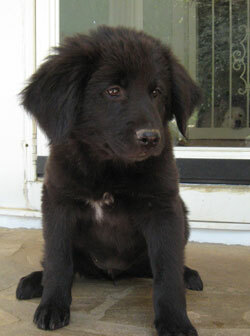 She looks labby in appearance, but is quieter and seeks the company of other puppies in the yard. She loves to share a toy or a stick and she hangs out with whoever will hang with her, or she will follow mama dog, Cora around. She's a real sweetie pie. She will be at our "meet and greet" this Sat, 6/14 at Best Friends in Sudbury from 11-1 PM and we prefer you fill out an application ahead of time. Scooter is a terrier-pointer mix who is coming soon. She weighs approx.15 lbs. She is being returned by the young family who adopted her and will be available at our Meet and Greet on Saturday at Best Friends in Sudbury from 11-1. 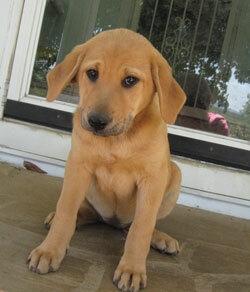 Sheba is a 13-14 week old female shep/lab mix puppy whose mom, Cora, looks like a Shepherd/Beagle. Sheba looks like a border collie mix, oddly enough. She is sweet, smallish, and shy in the house, but outside she is in her element. She is a very lovable and adorable puppy. She will be at our "meet and greet" this Sat, 6/14 at Best Friends in Sudbury from 11-1 PM and we prefer you fill out an application ahead of time. Silvia is a 2 year old Border Terrier mix who was abandoned on the side of a road when she was very pregnant and heart worm positive. She was treated for heart worms and will be finished in time to attend our Paws in the Park event on June 8th at Pierce House, Lincoln, MA from 10-3. Please come and say 'hi' to her and she says that if you donated to help pay her expenses that she will give you special kisses. She will be looking for her new family at Paws and hope that is you. 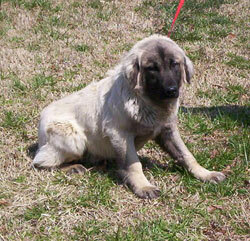 She will be spayed prior to going to her forever home. 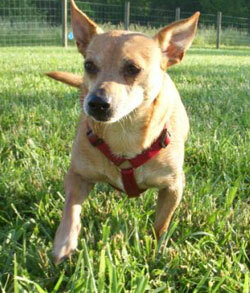 Silvia loves people and her one bad habit is that she loves to chase cats (so no cats!). She's affectionate, playful, and very eager to please. She loves to cuddle, sleeps on the bed and does not make a sound all night. Silvia weighs about 20 pounds. Suzie is one of two Labradoodles who recently arrived. Suzie is an active dog and will run a small dog ragged, but also needs people attention so is not just a "friend for a dog" as she needs tons of attention and is very responsive to training. If you are interested,please fill out an application on line. Suzie and Sally were sisters who were relinquished by an owner who didnt have time for them. She kept them in a pen. 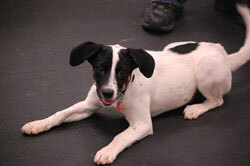 Suzie deserves a great home where she can be loved, get alot of attention and activity/play time. She is personable, extremely intelligent and VERY playful! She would torture a cat because she chases and wants to play, but it would drive a cat crazy. She wants a fenced in yard, older kids, and another dog if possible. That's her wish list. No invisible fence, please. 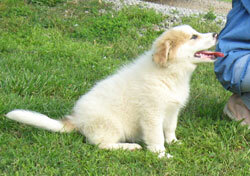 Tilly is a sweet 3 month old Great Pyrenees mix, but is not large like the breed. She came in with her sister, Zoey. They have had their first parvo shot, been wormed and had bordetella. They are cute and playful. Mom is Pyrenees, dad is Komondor. She is not that large, not like a Pyrenees at all. Here's what her foster mom says about her: What a little doll this puppy is. She is doing really well in thecrate and with house training She loves playing with her toys and barked at Casey a few times now. She is learning to sit and even to ring the bells to go out. She's a smart one. Lara had her going through the agility tunnel earlier too. Well just wanted you know we are doing great. We require a fence for families with children 10 and under and we do not want our puppies left alone all day with just a break in the middle. The rule of thumb for puppies is not more than one hour alone total for every month of the pup's age, so 3 months is not more than 3 hours alone. We cannot hold dogs/pups for you while you are on vacation and these pups need ready and willing adopters as we have other dogs waiting to come in. The situation in TN is urgent right now and the humane society we work with is overflowing, so please be sensitive to this issue when selecting a rescued dog. Ziggy is a playful 12 week old fluff ball. He looks to be mixed with a little Golden Retriever, although they said Great Pyr because he's white, but it could be Samoyed. He came up from TN and is happy to get out of the heat. He is around 10-12 wks old we think. Cute, friendly, playful. Almost housebroken. 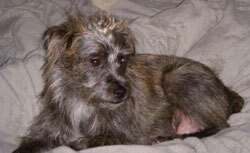 He is in a foster home in Wayland and can be seen M-F once we receive your application. Don't wait til the weekend as he will be gone. He came in with his sister Plum. They have had their first parvo shot, been wormed and had bordetella. He is very laid back for a puppy, shares toys with Zoey and is housetrained. We require a fence for families with children 10 and under and we do not want our puppies left alone all day with just a break in the middle. The rule of thumb for puppies is not more than one hour alone total for every month of the pup's age, so 3 months is not more than 3 hours alone. We cannot hold dogs/pups for you while you are on vacation and these pups need ready and willing adopters as we have other dogs waiting to come in. The situation in TN is urgent right now and the humane society we work with is overflowing, so please be sensitive to this issue when selecting a rescued dog.